This is a continuation of a travel series to Savannah, Georgia. If you'd like to start at the beginning, go HERE. And HERE is a post of a lovely historic home we rented for the week. Day 2 in Savannah was our first full day in the city. On our first day in Savannah we arrived mid-morning and took a trolley ride, checked into the home we were renting for the week, and went to City Market for some dinner. On our second day, we did so much I will be covering it in two or three posts so they don't get too long. Our rental home was located only three blocks from Forsyth Park; so I was blessed to see it every day we were in Savannah! I was thrilled with that, because this park, and particularly the fountain, was my absolute favorite thing about Savannah. I don't know what it was, but there was a magical quality to this place. I loved the fountain. The white stone with the the beautiful sprays of water was so eye-catching! You see can see this fountain from quite a distance away because that white stone really stands out against the green landscape. But the placement of the fountain in the park along with the gorgeous moss covered trees also contributed a lot to the beauty of this fountain. Forsyth Park is a large city park that occupies 30 acres. It has a children's play area, a garden, tennis and basketball courts, yada, yada, yada, but it is most famously known for this fountain. If you see a picture of this fountain, you know it's in Savannah, Georgia! The fountain was added in 1858 and is reminiscent of fountains in Paris and in Peru. And would you believe it was just ordered from a catalog? Yup, it's true! This gorgeous piece was not an original designed for the park, but just ordered from a catalog. I love it! This is a very active park. Every day we saw people running through the park, exercise groups doing yoga, kids sports teams, families taking walks, and of course all the tourists wanting a picture by the famous fountain. During the day it is well protected by policemen on horseback. There is a Confederate Memorial Statue in the middle of this park that is dedicated to the volunteers who gave their lives fighting for the Confederacy. Also in the park is a Fragrant Garden For The Blind. It is enclosed by a concrete wall and iron gate which is locked at night. It is such a experience for the senses to walk through this garden. You can smell the roses long before you enter through the gates. After visiting the garden and taking a few pictures by the fountain, we headed for the infamous Mercer-Williams house. When I was planning my trip to Savannah everyone recommended reading the book "Midnight in the Garden of Good and Evil" before going for it would give me a taste of Savannah culture. Well, I didn't have time to read the book, so my husband and I sat down and watched the movie one night. I didn't know anything about the subject matter beforehand so you can imagine our surprise as it wasn't the type of movie my husband and I usually would watch. We also had no idea the book and movie was based on a true story. But, the movie was still worthwhile to watch because we got glimpses of areas we would see for ourselves when we were in Savannah and we did find the cultural aspect interesting. Well, now that we saw the movie and learned it was a true story, I had to take a tour of the infamous Mercer-Williams house. They did not let us take any pictures indoors, so you will have to take my word for it that this is one gorgeous home! Or, you can see the movie because it was filmed inside the home. This home was used not just for the "Midnight in the Garden of Good and Evil" movie, but many other Hollywood films as well such as "Glory". Now, for those of you who have no idea what I'm talking about, I'll give you a brief synopsis of the book/movie/true story. 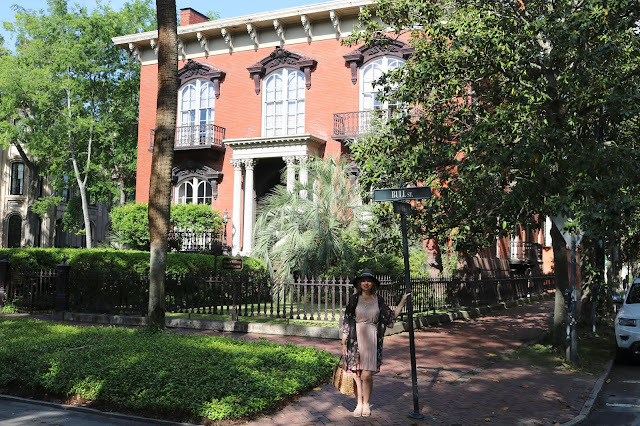 James Williams was a art dealer and house restorationist in Savannah. He purchased this home in 1969 and it was in this home that he shot and killed his male assistant of which he was also having a sexual relationship with. He was the only person in the state of Georgia that was tried four times for the same crime and found innocent only to die a short time later in his home of a heart attack. And, it is reported that he died in the same spot where eight years later his assistant was killed. This is where the "voodoo" culture of Savannah comes into play that is woven throughout the "Midnight in the Garden of Good and Evil" book. The sister of James Williams still lives in the home so only the main level and garden is open for tours. I was disappointed that we couldn't see the whole house, but I certainly understood why. She was home the day we toured and just finished eating breakfast in the kitchen before heading upstairs. She does use the whole house, but only comes downstairs when there are no tours. She owns a cute black kitty, and he comes downstairs whenever he feels like it. We got a sneak peak of him before he ran away. As I stated earlier, this house is gorgeous. The windows go from floor to ceiling letting in so much natural light. The spiral staircase is breath taking with this beautiful stained glass circular medallion above it. And the flooring is a beautiful tile. The entire home is filled with James Williams art collections. But as much as I loved the design and decor of this home, my favorite part was when we entered the office and our tour guide explained that this was the room the "incident" took place. There were also personal photos in this room of Clint Eastwood (who directed the film) on the property engaging with other family members during filming. We absolutely loved our tour guide. He provided so much information and was such a good story teller. We found it interesting that he never used the word "murder" and always called what happened in this house an "incident". He spoke of Mr. Williams with the utmost respect. He also made it clear that he was found innocent. Even though the tour was short and sweet and cost $12.50 per person, if you read the book or saw the movie, it's a must-see. It's really fun to step into the hallway and remember scenes from the movie. The floor especially struck me, because I remembered noticing that gorgeous tile in the movie. Lady Chablis, who played herself in the movie, passed away in 2016 but the place she performed is still operating in Savannah. They have this memorial to her on an outside window of the building. The famous "Midnight in the Garden of Good and Evil" played a huge role in Savannah tourism, stimulating a 46% increase in tourism to this stunning city. They have special "Midnight in the Garden of Good and Evil Tours". Every store has copies of the book available for purchase and other "Midnight" merchandise like T-shirts and "Bird Girl" statues. The book was first published in 1994 and became a New York Times Best-Seller for 216 weeks and remains the longest standing New York Times Best-Seller ever. Well after our tour of the Mercer-Williams house we spent a few hours walking some of the squares of Savannah and looking at old homes. There are so many beautiful old homes in Savannah. My husband took hundreds of pictures but I can't possibly show them all so below are some of my favorites. I found myself very attracted to the homes that were made of a grey/white brick. It made me want to go home and paint my red brick house. There were so many different styles of homes. Some were small, other's were almost large enough to be called a castle...but they all had unique charm. Brick and ironwork were a common sighting in most of the homes. The moss covered oaks and palmettos also added a lot to the beauty of each home. I just loved these cute, colorful little cottages. The Lucas theater is a revived 1920's building that still hosts national and local stage productions, musical acts and film screenings. 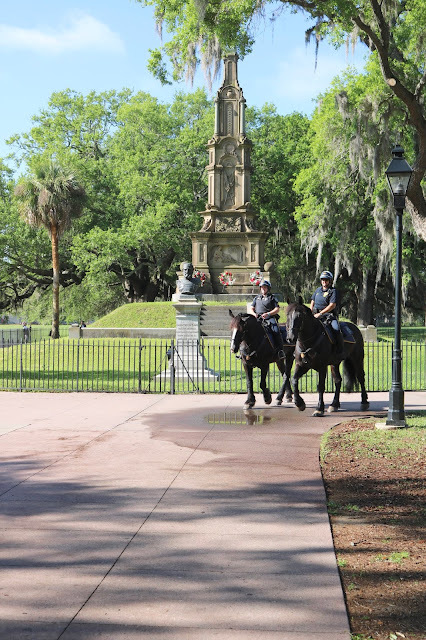 Savannah's historic district is a laid out in a one mile square grid; which makes it very simple to navigate. Within this square mile are 22 "Squares" or small parks each with it's own unique monument, dedication, or memorial. My husband and I loved the squares so much, we visited each and every one. Along with the Forsyth Park fountain and the Mercer-William's home, the squares were in my top three favorite things in Savannah. 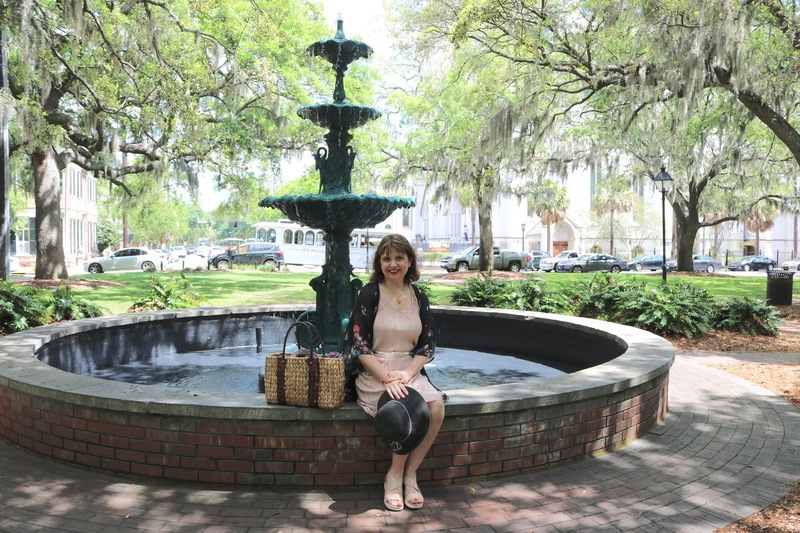 It is the squares which makes Savannah so beautiful because they add so much ambiance to the neighborhoods. And the monuments in each square provide so much history! The five squares along Bull Street: Monterey, Madison, Chippewa, Wright, and Johnson are Savannah's "Crown Jewels". If you don't have the time to see all the squares in Savannah you must see these five. The Chippewa Square is where Forrest Gump sat on the park bench . That specific bench is no longer there. The Johnson square was my husband's favorite...hmmm, I wonder if it's because it bears his last name? This is the John Wesley monument in the Reynolds square. Some of my favorite squares were the smaller ones which I enjoyed simply for their pretty fountains, gazebos, or peacefulness. We spent two days exploring the squares of Savannah. It takes a long time, especially if you read all the plaques. One morning we woke up at 5:00 am so we were outside by 7:00 a.m and we just enjoyed walking in these gorgeous squares listening to the birds and experiencing the serene beauty of these squares. The squares are what makes Savannah special and set it apart from any other city I've ever visited. The natural element of so many parks located in a city keeps urban development at bay and creates a garden oasis in every neighborhood. I loved it! Next week I'll cover one of my other favorite spots in Savannah: River Street! Oh Savannah, what a beautiful city! Yes it is! Thanks for visiting! Thank you for sharing more of beautiful Savannah! I love the charming homes! It looks beautiful. Love those moss covered trees! I am not familiar with the movie or book either, but interesting story! It is so beautiful, and the trees add so much to the charm and beauty of Savannah. I am surprised so many people have not heard of this book/movie. I've heard about it most of my adult life, but I am quite old now! haha! I'm drooling over those houses! I have always wanted to go there, it looks so enchanting. Enchanting is the perfect word to describe Savannah! You are an excellent narrator. And the houses are beautiful, I love the ones with wooden balconies. Thanks so much Julie. Do you have a blog that I can visit. I can't seem to find one. This looks like such a fun time. I've heard Savannah is a beautiful city! It is a beautiful city, and so much fun! The Spanish moss trees are SO pretty- and Savannah is so lovely! Yes, that moss makes the trees even more beautiful. I would love to visit this special city sometime. I thoroughly enjoyed all of the photos you took of all of the different homes. They are all so unique in their own way. That fountain is beautiful! Thanks Carrie! I've never seen so many beautiful homes in one city before! Thanks Sylvia, yes, Savannah is the place to go for History lovers! Yes, we always love taking some kind of tour to get a general feel for the place. And the smell of roses was wonderful, especially since we don't see roses till July in August. Oh, we came across more than 2 fountains! Savannah has a lot of them. What a beautiful and historic place to visit. My sisters and I have Savanna on our bucket list for places to visit. It's a great place to have on your bucket list...especially for a girl's trip! I haven't been to Savannah in years! It was nice to re-vist through your blog! I'm happy to bring back memories of this special city to you Nancy! We have never been but looks like a beautiful place to visit. Yes it is, you must visit sometime! So good to know about the book and movie. I am planning a trip to Savannah and have pinned your post to look over again before I go. Thanks Cathy! I will be writing about Savannah every Wednesday for the next month or more so be sure to check back for more posts. Absolutely beautiful! Sounds like you had a lovely time! Thanks Lori! Yes, we did. I was in Savannah several years ago and loved it! Thanks for the beautiful pictures and a reminder that I really should go again. Enjoyed this post! Thanks Kimberly, I hope you get back sometime soon! Savannah is well known for it's ghosts and many places claim to be haunted. They also have lots of ghost tours available. We ate at the Pirate House which claims to have hauntings, but I did not sense anything outside of the usual. I love Savannah. I visited several years ago, but it is on my Bucket List to return. Thanks for sharing your lovely memories on Sunday's Best.